A beautiful and modest butterfly jilbab without sleeves. A elegant and timeless look made in 2 pieces, one jilbab head piece with elastic opening for the hand and a skirt or sirwal paired with it. Please choose a skirt or sirwal that fits your length best, choose between petite, standard and plus size and what options you would like to add. for more information about the sizes and options please see the information under “options” and “size guide”. Need longer or shorter than sizes available? Please contact us. Please note: Measurements are approximated and small differences may occur. You can choose to add pockets to your skirt or sirwal, the pockets will be added into the seam on the sides and are a deep pocket suitable to place your phone or keys in, in sha Allah. All our skirt and sirwals have elastic band in the waist, however some sisters prefer to have a drawstring for easy adjustment of the waist. 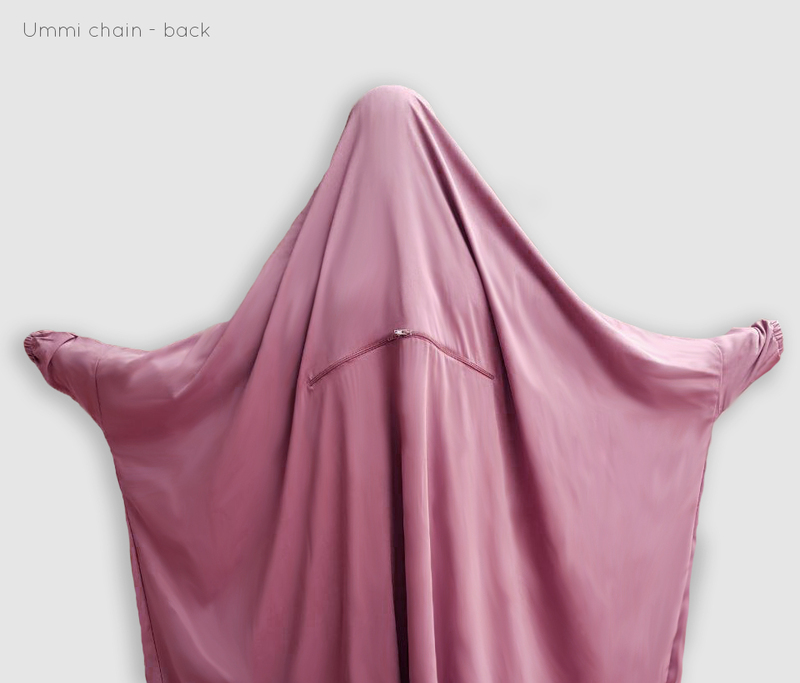 You can choose to add so called "niqab straps" to your jilbab. This will enable you to wear your jilbab so that the fabric you usually wear under the chin can be lifted up to cover the face. When a baby needs extra closeness to their mum many of us sisters choose to wear a sling or a baby carrier. 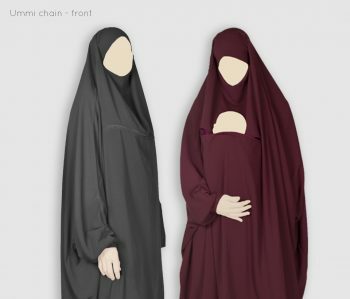 The ummi zipper, a horisontal zipper, makes it possible to wear the sling or carrier underneath the jilbab so we don't have to compromise on the conditions of the hidjaab. 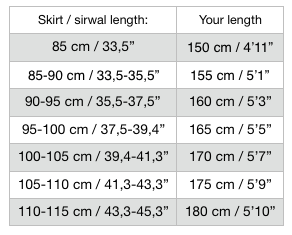 How do I know what skirt or sirwal length to choose? What's the waist measurements of the skirts? Our skirts have a elastic band to make it comfortable and suitable for most body shapes. The measurement of our standard skirt (if you don't choose plus size) is 38 to 60 cm, meaning measured straight over the elastic band when first not stretched and then when stretched. If you choose plus size this measurement will be 50-90 cm. What's the length of the jilbab? When you choose skirt or sirwal length the length of the jilbab will be suitable for that choice. What's the difference between Standard and Petite? The difference is in the width of the jilbab. Our standard is most suitable for sisters that are 165 cm or taller, since its wider and therefore also have longer sleeves. Petite have smaller width which means it have shorter sleeves, suitable for sisters 163 cm and shorter. If you choose plus size this will make the skirt wider (50-90 cm).